Let’s face it – if Alice were a new mother, it wouldn’t have been a rabbit after which she tumbled down a dark hole. No, it would have been the spiraling mental anguish of a sheer lack of sleep due to the sudden presence of a very small creature unable to communicate in any other way but with a loud piercing shriek. The way I see it, Alice is walking through the daisy covered field, singing happily or humming a light-hearted tune and then WHAM! A loud shriek fills the air and down she tumbles, clawing at the sides of the dirt encased tunnel to keep from falling any further. Sleep deprivation is a serious issue for anyone. But toss in a new mother with hormones bouncing in every direction topped off with a new little being to care for, and a zillion people babbling advice at her all at once, it’s enough to tip the scales in the wrong direction. To add to this negative balance, turns out Postpartum Depression can aggravate already impaired sleep quality. There are a few reasons you may not be getting decent sleep as a new mom. Depression is one of them. Two other conditions that can wreak havoc with your sleep are Thyroiditis and Anemia. Both of these conditions can leave you exhausted even if you are sleeping the required 6-8 hours a night. Be sure to ask your doctor to screen for both. It’s a simple blood test. The results will make a world of difference if positive. Anti-depressants will not treat thyroiditis or Anemia. You’ll need a different approach altogether. Treatment for thyroiditis or anemia may include hormonal or iron therapy to get things moving in the right direction. It’s been almost two years since I have been a brand new mom but recently I received a stark reminder of what sleep deprivation will do to someone. Our oldest daughter has been sick repeatedly since January. The most recent bout really took it out of me. One evening, I gathered fresh sheets to make up one of the kid’s beds. I carried them straight into the living room and almost made up the space heater instead. Thankfully I realized what I was about to do and turned myself around before placing sheets on the heater. I was shocked I had let myself get to that point. I remember when the kids were still nursing. I’d finish up nursing them, crawl into bed, only to be woken up by my husband in what seemed just five minutes later to nurse again. With just one kid, it was easy to recover during the day. Recovering from the same scenario with two toddlers and a newborn who just doesn’t want to quit is even harder. Lack of sleep is a debt which adds up quickly. According to recent research, sleep loss is not something we can ever make up. That’s right – sleeping in on the weekends doesn’t really help. As mothers, we often forget to mother the most important person in our lives – OURSELVES. If we are not healthy, we are then not able to take care of those around us. If we cannot take care of those around us, they become grumpy, unhappy, and unhealthy, giving birth to a very vicious circle which is difficult to escape. However, if we take care of ourselves by making sure we eat right, sleep right, exercise, and feed our souls, those around us will be happier and our kids will have a positive role model on which to base their own behavior. I know telling a new mother to simply get some rest is so much easier said than done. Talk with your support people prior to delivery. Make sure that sleep is high on the list. First, actually. Before the dishes, before laundry, before anything. In fact, British researchers recently concluded that women need 20 more minutes of sleep than their male counterparts. Why? Because we do more “jobs” with our minds. For instance, right now? I’m blogging, researching, listening to the movie my kids are watching, keeping up with where my kids are in the room (on the couch relaxing right now, thank goodness! ), praying the trash truck doesn’t set off too much of a barking event with the dogs, and thinking about what I’m going to make for dinner. I’m also reminding myself about several tasks I need to complete today. Women, by nature, are multi-taskers. Our minds race ahead of themselves at a very fast pace all day long. The extra 20 minutes of sleep allows our minds to rest just enough to be able to get up and do it all over again the next day. A new mom is struggling to figure out how she’ll get the chores done, feed the baby, soothe the baby, get a shower, breathe, cook, and fit everything else she used to do into her now controlled by a tiny creature life. It’s not easy. Eventually routine happens. One little thing at a time. Start small. In the morning, make yourself a cup of tea. Sure, it’s not the dishes, but it’s for YOU. If you’re nursing, the more relaxed you are, the easier it will be for your child to get your breast milk flowing. Then, when you are done, take a few seconds to clean your tea cup/mug/glass. See? One dish done. My great-great grandmother once shared a piece of advice with my mother she never forgot and then thankfully passed down to me. If you’re in a room doing something, take a few seconds to clean. In the bathroom? Clean the sink. Heading to the kitchen? Take any dirty dishes with you and rinse them out if needed. If you get in the habit of cleaning up after yourself bit by bit, there is no large task looming ahead of you. Just tiny little ones here and there. And this is how developing a routine begins. It may not happen overnight, but it will happen. And once it does, I bet some of the anxiety about housework fades and your sleep starts to improve. Going back to the topic of sleep, it’s important to develop a routine there. In the first few weeks after giving birth it will be hard to have a dedicated routine and frankly, you’ll probably be asleep before your head even hits the pillow when you have a chance to clamber (ok, race) to bed. But once you’re through the first few weeks and baby starts to sleep better, start with just one activity to initiate your bedtime. Some common things to do are: read a book, take a shower or hot bath, drink soothing tea (not caffeinated is important here! ), warm milk, a favorite TV show, pray or meditate. As time moves on you can combine these things – take a shower, read a book and have some soothing tea. Or watch a TV show and drink some warm milk. Napping has also been shown to help with mental acuity. Albert Einstein and Thomas Edison allegedly never slept for long periods of time. They napped here and there. A fifteen to twenty minute power nap can do amazing things. Recent research showed that people who took a 90 minute power nap after lunch scored up to 10 percent higher on a cognitive test than those who did not. Stages of sleep affect our body and minds differently. To understand the different stages a bit better, check out this piece by Diana L. Walcutt, Ph.D at Psych Central. The keys to recovering a good night’s sleep after giving birth to a baby is to slowly incorporate routine back into your life, asking for help and support, and remembering to Mother the most important person in the house. YOURSELF. 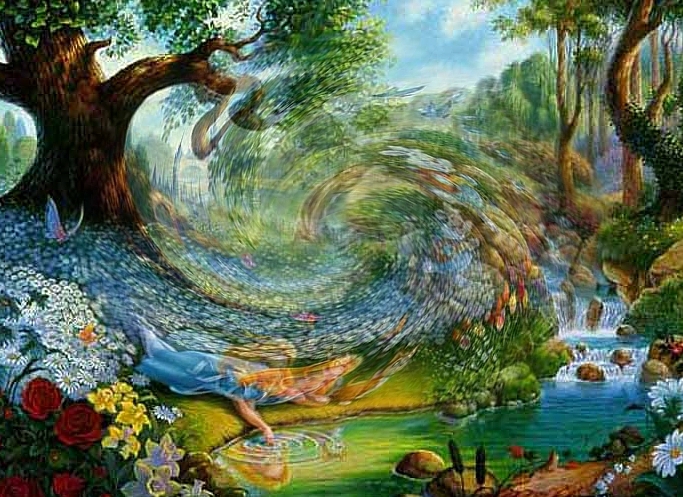 This entry was posted in infant, motherhood, postpartum depression, sleep and tagged Alice in Wonderland, nap, new mother, rabbit hole, sleep deprivation on March 10, 2010 by LHale. Great post on a topic near and dear to my heart, since insomnia was my very first PPD symptom. In the first couple of weeks after I had my daughter, my mother kept reminding me to take it easy. I didn’t think I needed to rest or nap because I selcom rested or napped during the day before the baby came along. What I didn’t realize at the time is that having a baby involves a huge change in a woman’s body that requires blocks of REM sleep to help her body recover. Moms need to remember to take care of themselves so they can take care of others. Sleep is important to stave off sleep deprivation which makes a new mom all the more vulnerable to PPD (esp. if she already has other risk factors). p.s. – I esp. appreciate the part about nearly making up the heater instead of the bed. Funny, while at the same time, scary….